Please join me in welcoming Bianca Danforth to the set of peers blessed with reviewing patches to Firefox and Toolkit. She’s been doing great work making testing experiment extensions easy and so it’s time for her to level-up. It’s a little overwhelming for my tastes. The Recent Activity section in particular is more than I need, it seems to list anything anyone has done with Phabricator recently. Sorry Ted, but I don’t care about that review comment you posted. Likewise the Active Reviews section seems very full when it is barely listing any reviews. But here’s the good news. Phabricator lets you create your own dashboards to use as your default view. It’s a bit tricky to figure out so here is a quick crash course. Click on Dashboards on the left menu. Click on Create Dashboard in the top right, make your choices then hit Continue. I recommend starting with an empty Dashboard so you can just add what you want to it. Everything on the next screen can be modified later but you probably want to make your dashboard only visible to you. 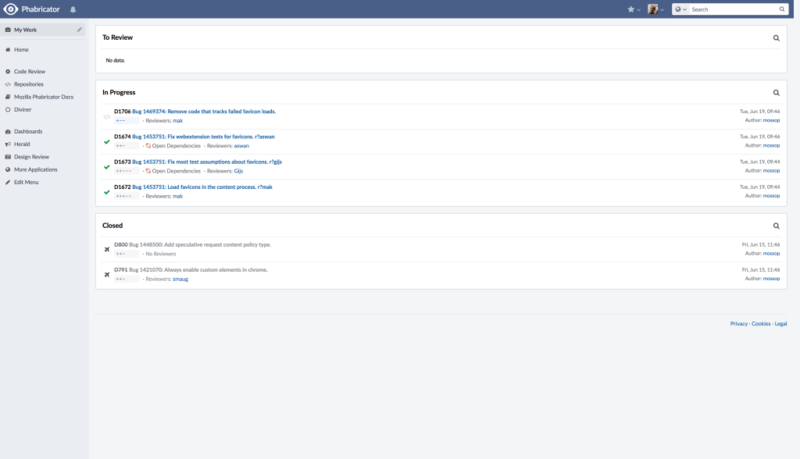 Once created click “Install Dashboard” at the top right and it will be added to the menu on the left and be the default screen when you load Phabricator. Now you have to add searches to your dashboard. Go to Differential’s advanced search. Fill out the form to search for what you want. A quick example. Set “Reviewers” to “Current Viewer”, “Statuses” to “Needs Review”, then click Search. You should see any revisions waiting on you to review them. Tinker with the search settings and search all you like. Once you’re happy click “Use Results” and “Add to Dashboard”. Give your search a name and select your dashboard. 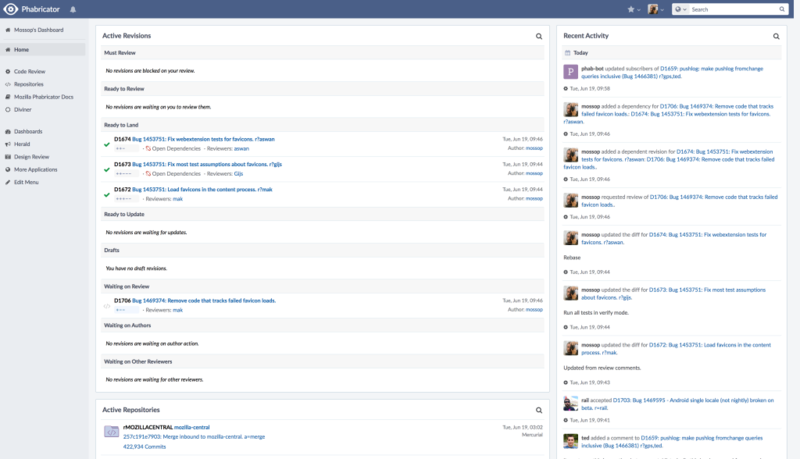 Now your dashboard will display your search whenever loaded. Add as many searches as you like! Like it? I made it public and you can see it and install it to use yourself if you like! I spend most of my time developing flipping back and forth between VS Code and Searchfox. 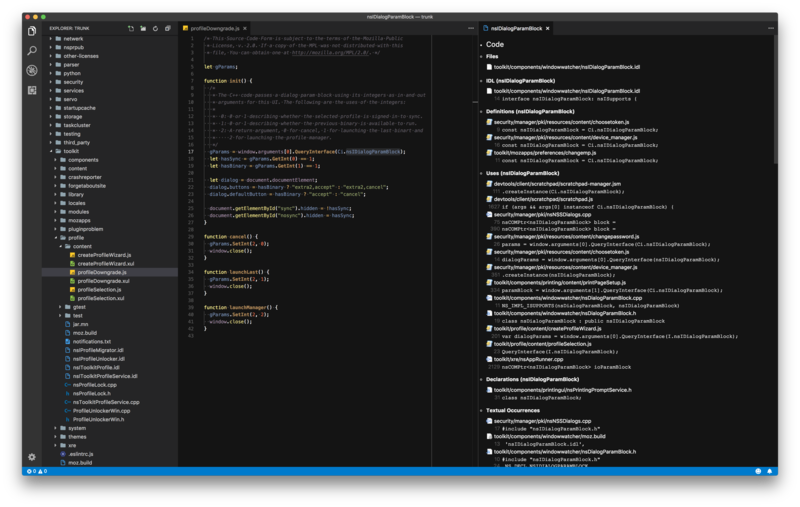 VS Code is a great editor but it has nowhere near the speed needed to do searches over the entire tree, at least on my machine. Searchfox on the other hand is pretty fast. But there’s something missing. I usually want to search Searchfox for something I found in the code. Then I want to get the file I found in Searchfox open in my editor. Luckily VS Code has a decent extension system that allows you to add new features so I spent some time yesterday evening building an extension to integration some of Searchfox’s functionality into VS Code. With the extension installed you can search Searchfox for something from the code editor or pop open an input box to write your own query. The results show up right in VS Code. Click on a result in Searchfox and it will open the file in an editor in VS Code, right at the line you wanted to see. It’s pretty early code so the usual disclaimers apply, expect some bugs and don’t be too surprised if it changes quite a bit in the near-term. You can check out the fairly simple code (rendering the Searchfox page is the hardest part of it) on Github. If you want to give it a try, install the extension from the VS Code Marketplace or find it by searching for “Searchfox” in VS Code itself. Feel free to file issues for bugs or improvements that would be useful or of course submit pull requests of your own! I’d love to hear if you find it useful. As you might gather I’ve been updating the peer list a lot lately trying to catch up with reality. If there is anyone I’m missing then please let me know! How do you become a Firefox peer? The answer may surprise you! So you want to know how someone becomes a peer? Surprisingly the answer is pretty unclear. There is no formal process for peer status, at least for Firefox and Toolkit. I haven’t spotted one for other modules either. What has generally happened in the past is that from time to time someone will come along and say, “Oh hey, shouldn’t X be a peer by now?” to which I will say “Uhhh maybe! Let me go talk to some of the other peers that they have worked with”. After that magic happens and I go and update the stupid wiki pages, write a blog post and mail the new peers to congratulate them. I’d like to formalise this a little bit and have an actual process that new peers can see and follow along to understand where they are. I’d like feedback on this idea, it’s just a straw-man at this point. With that I give you … THE ROAD TO PEERSHIP (cue dramatic music). Intro patch author. You write basic patches, request review and get them landed. You might have level 1 commit access, probably not level 3 yet though. Senior patch author. You are writing really good patches now. Not just simple stuff. Patches that touch multiple files maybe even multiple areas of the product. Chances are you have level 3 commit access. Reviewers rarely find significant issues with your work (though it can still happen). Attention to details like maintainability and efficiency are important. If your patches are routinely getting backed out or failing tests then you’re not here yet. Intro reviewer. Before being made a full peer you should start reviewing simple patches. Either by being the sole reviewer for a patch written by a peer or doing an initial review before a peer does a final sign-off. Again paying attention to maintainability and efficiency are important. As is being clear and polite in your instructions to the patch author as well as being open to discussion where disagreements happen. Full peer. You, your manager or a peer reach out to me showing me cases where you’ve completed the previous levels. I double-check with a couple of peers you’ve work with. Congratulations, you made it! Follow-up on review requests promptly. Be courteous. Re-direct reviews that are outside your area of expertise. Does this sound like a reasonable path? What criteria am I missing? I’m not yet sure what length of time we would expect each step to take but I am imagine that more senior contributors could skip straight to step 2. Feedback welcome here or in private by email. Posted on September 13, 2017 September 20, 2017 Categories mozillaTags development, module, peer3 Comments on How do you become a Firefox peer? The answer may surprise you! While going through this round of peer updates I’ve realised that it isn’t terribly clear how people become peers. I intend to rectify that in a coming blog post. New Firefox and Toolkit module peers in Taipei! Please join me in welcoming three new peers to the Firefox and Toolkit modules. All of them are based in Taipei and I believe that they are our first such peers which is very exciting as it means we now have more global coverage. I’ve blogged before about the things I expect from the peers and while I try to keep the lists up to date myself please feel free to point out folks you think may have been passed over. For a long long time Mozilla has governed its code (and a few other things) as a series of modules. Each module covers an area of code in the source and has an owner and a list of peers, folks that are knowledgeable about that module. The full list of modules is public. In the early days the module system was everything. Module owners had almost complete freedom to evolve their module as they saw fit including choosing what features to implement and what bugs to fix. The folks who served as owners and peers came from diverse areas too. They weren’t just Mozilla employees, many were outside contributors. Over time things have changed somewhat. Most of the decisions about what features to implement and many of the decisions about the priority of bugs to be fixed are now decided by the product management and user experience teams within Mozilla. Almost all of the module owners and most of the peers are now Mozilla employees. It might be time to think about whether the module system still works for Mozilla and if we should make any changes. In my view the current module system provides two things that it’s worth talking about. A list of folks that are suitable reviewers for code and a path of escalation for when disagreements arise over how something should be implemented. Currently both are done on a per-module basis. The module owner is the escalation path, the module peers are reviewers for the module’s code. The escalation path is probably something that should remain as-is. We’re always going to need experts to defer decisions to, those experts often need to be domain specific as they will need to understand the architecture of the code in question. Maintaining a set of modules with owners makes sense. But what about the peers for reviewing code? A few years ago both the Toolkit and Firefox modules were split into sub-modules with peers for each sub-module. We were saying that we trusted folks to review some code but didn’t trust them to review other code. This frequently became a problem when code changes touched more than one sub-module, a developer would have to get review from multiple peers. That made reviews go slower than we liked. So we dropped the sub-modules. Instead every peer was trusted to review any code in the Firefox or Toolkit module. The one stipulation we gave the peers was that they should turn away reviews if they didn’t feel like they knew the code well enough to review it themselves. This change was a success. Of course for complicated work certain reviewers will always be more knowledgeable about a given area of code but for simpler fixes the number of available reviewers is much larger than it was otherwise. I believe that we should make the same change for the entire code-base. Instead of having per-module peers simply designate every existing peer as a “Mozilla code reviewer” able to review code anywhere in the tree so long as they feel that they understand the change well enough. They should escalate architectural concerns to the module’s owner. This does bring up the question of how do patch authors find reviewers for their code if there is just one massive list of reviewers. That is where Bugzilla’s suggested reviewers feature comes it. We have per-Bugzilla lists of reviewers who are the appropriate choices for that component. Patches that cover more than one component can choose whoever they like to do the review. A few things are happening which means there are a bunch of new Firefox/Toolkit peers to announce. All of these folks have been doing reviews for some time now so this is largely just book-keeping but welcome to the fold anyway! It’s that time again when I get to announce a new Firefox/Toolkit peer. Shane has been involved with Mozilla for longer than I can remember and recently he has been doing fine work on webextensions including the new sidebar API. As usual we probably should have made Shane a peer sooner so this is a case of better late than never. Respond to review requests promptly. If you can’t then work with the patch author or me to find an alternate reviewer. Only review things you’re comfortable with. Firefox and Toolkit is a massive chunk of code and I don’t expect any of the peers to know it all. If a patch is outside your area then again work with the author or me to find an alternate reviewer. Please congratulate Shane in the usual way, by sending him lots of patches to review!